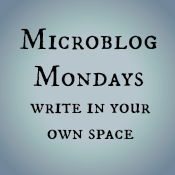 Microblog Mondays – sweaty, cranky and well baked. Roast turkey, two sticky toffee puddings, one apple pie, one lemon meringue, one frittata,one flourless chocolate cake – and I had one slice of each. I kept busy and managed to keep my Christmas brooding down to a dull roar. Cocktail of the season is the Moscow Mule, which is vodka, ginger beer and lime. Spicy, sassy and definitely not sweet. Like myself. I missed having my mum (and my side of the family which may be or may not be a good thing)with me on Christmas Day but that’s the way it goes. It’s not like Mum knows what day it is anyway. We went to see her on Boxing Day with presents and we had a great visit. Boo, hubby and even my father in law danced for her and everyone had a laugh. It’s just tough leaving her, you know? And now that the holiday season is just about done, I’m now acknowledging menopause season. I woke up one night in my brand new fleece pjs sweating like crazy, I hurriedly unbuttoned, it passed, and I went back to sleep. Alcohol really impacts hot flushes and I’ve been drinking quite a bit over the last couple of weeks, so I guess the fun is over and I’m going dry in the New Year. Two periods in one month, that’s never happened before either. No wonder I was Ms. Crabby McBroody. All that pinging going on in my ovaries – feels like they’re saying, hey lady, we’re popping out all the old eggs at once! Ah, the month of January is going to be interesting. I’m hanging in there during this Christmas season. I love the Christmas lights, oh by summer solstice I am desperate for lights. And for Moscow Mules, Cranberry and vodka and wine. But never mind that. I’m enjoying my son’s enthusiasm for the yuletide season, he’s been singing Christmas songs, and oh, yeah, my first Christmas concert at his school! That was wonderful even though I could barely catch a glimpse of him (it was packed) singing to Little Saint Nick with a santa hat, sunglasses and neon orange attire. He hasn’t asked much for Christmas, just an Ironman toy. I went back to the specialist, waited and waited while they got a more detailed report of my ultrasound last month (that was supposed to happen before I got there, but there you go). They measured two of the multiple calcified fibroids a being 3 and 4 cm, not so big as to be of concern apparently. The options given weren’t really great (an IUD (WTF? ), birth control pills (WTF? ), hysterectomy (umm, though I’d love to be on bedrest and I might even lose weight….errr. no thanks) and so I’ll just muddle along. Not sleeping that great. Random pings of pain in my ovaries, that crampy feeling even though I had my period just 2 weeks ago. Hate the thought of my mum not hanging with the family at home, but we’ll go visit her. I’ve made two sticky toffee puddings, gingerbread cookies with Boo, and next up is lemon meringue pie….no, none of it is gluten or sugar free, thanks for asking. 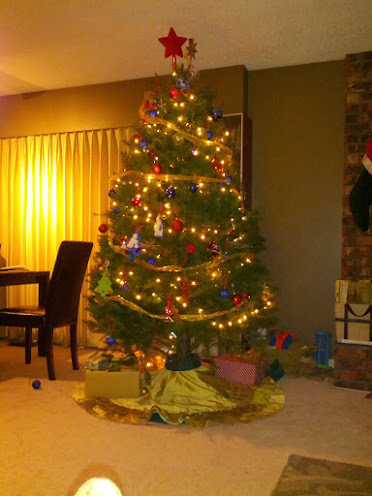 Happy Holidays, Merry Christmas, Happy Kwanzaa and Chanukkah, wonderful people! Microblog Mondays – Crafty me! It’s my least favourite time of year, so I gave myself a craft to do. And this is it! 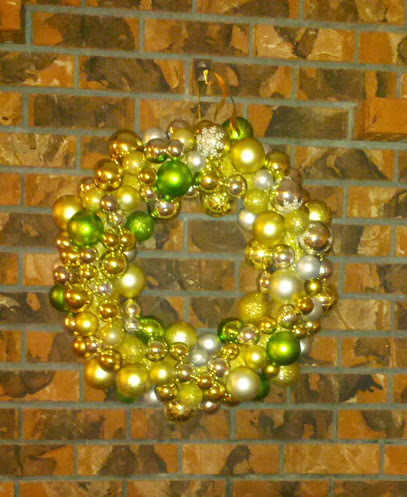 I underestimated the amount of Christmas balls I would need and had to scour dollar stores and could not find any more green balls (which do not actually charge $1 by by the way – don’t get me started) and finally finished it! I loved doing it and found it very soothing. I’m going to tell you a little story. A couple of weeks ago I went to the bank and took out some money out of my business account. I was a little surprised when the receipt said I had minus $5000 and change. Well, first of all, I knew I didn’t have that kind of money. And then there was the issue of the MINUS part. I had an appointment so I had to go to that but I rushed back later and went into the branch so they could explain what the hell was going on. Seems like when I updated my debit card which was linked with my business account – and had been for 20 years or so, it was no longer linked with my business account BUT MY LINE OF CREDIT! The one I have scheduled preauthorized payments to pay it down since I haven’t used it since IVF days. So I was basically spending money I didn’t have. Making sizable payments on my Visa when I probably could have paid a bit less. The teller then reversed all the charges through my business account while I considered either screaming or hyperventilating. Well, in the end, I didn’t have much left. My bank started charging $2 a month (for each account) for paper statements (crazy, right?) so I elected to go online. Perhaps I need to bite the bullet and keep the paper. And now I’m going to segue all this money stress into Christmas time……hubby starting a new business means no steady paycheque. Yet he’s in a much better mood so that’s something to be grateful for. I didn’t get the part from my last audition which would have meant a decent financial finish to the end of the year, but a project I’m attached to did get funding so that’s something to look forward to. The Christmas lights have gone up in the neighbourhood which I really enjoy; it certainly does brighten up otherwise dark streets. I saw my mum on the weekend and brought her a poinsettia plant. I miss her especially around this time of year, especially since she’s become confined to a wheelchair. Ah, well, truth be known I’m always a bit out of sorts during holiday time, so the best cure is to just stay busy, bake lovely things and remember just how lucky we are. I always enjoy going to my book club meetings. There’s always this great camaraderie amongst us black sisters. It’s a rare thing for me in this city to be surrounded by various shades of the same colour of women. It’s hard to get a bunch of women together on a semi regular basis just to share a few laughs and talk about a book (that I have rarely even finished). It’s always a gift. Just this past Sunday, only 2 of us made it this woman’s house not too far away from me. I was late because I had rushed out to grab a coffee from Starbucks and head on over to where we usually meet only to find out once I parked that I had forgotten my phone, went back home to retrieve it, then go directly to the place only to realize that it wasn’t there but another woman’s house and after much wrangling with my phone’s GPS, I finally arrived almost 40 minutes late. Oh, but we were treated to a most delightful West Indian meal of curried goat, channah, roti and rice. I was in heaven! I couldn’t stop smiling. We started to talk about our latest read, I.nfidel by Ayaan Hirsi Ali. At one point, I said I had no regard for any religion that could not offer happiness and equality for all people. Somehow we got on the topic of where our hostess goes to church. She then proceeds to tell us that she goes to a church led by a priest who left the main branch because he refused to marry gay people. And that she agreed with that. Oh yeah and that the reason there is homosexuality is because of overcrowding (i.e. in prisons) and even in the animal kingdom, animals only do that if they are forced to due to lack of space for ranging. WTF? I told her that first of all, you couldn’t compare human beings to animals and also that homosexuality has been around forever, and that it has nothing to do with “overcrowding”. I didn’t get very far before my other friend piped in about something completely unrelated. I was gobsmacked. Here was a highly educated woman, a professor, no doubt, who was funny, charming and articulate who had cooked me one of the heartwarming meals I had eaten in quite some time. She had just boxed up leftovers to take home to my husband and son. I debated in my mind just exactly what to say next and how to say it. In the meanwhile, the other woman just filled in space with some other trifling matter. I tried to get back to a story I wanted to share about an old friend of mine who had become a born again Christian and once again, I was interrupted by the other woman who just had to mention something. I debated once again about whether I should return to my story because the point was that this young man I had considered a kid brother and friend was unable to spend time alone with me any longer because it was inappropriate, that somehow being alone with me would lead to temptation or some other horseshit like that. In fact, while I was waiting for him, his male roommate entertained with me boring vacation pictures with the apartment door WIDE OPEN. Then I could tie back to the themes we were discussing where the author of Infidel discusses female subjugation in the name of religion that just because you were devout ANYTHING didn’t give you a divine right to oppress or denigrate groups of people. Or maybe I would just say one of my best friends is gay and if he were to get married tomorrow, I’d be thrilled or maybe I should have said, hey, my brother in law is gay and he’s married. So there. But instead I said nothing and thanks to the other woman who prattled on despite my baffled face or (did my face betray my heart) and five minutes later, I’m walking to my car, boxed food in hand and feeling a bit sick. I had made my point, but I hadn’t challenged her head on. I always find it interesting when someone who belongs to a race of people with a history of enslavement, oppression and institutional racism seem blind to the fact of their own bigotry towards gay people. I’ve just never sat at the table of someone who grabs your hand to say grace one minute and then allows crap to fall out her mouth. What makes it worse is that she thinks she’s right in holding that attitude because of scripture. But I’m pretty damn sure some people can find some sort of scripture to justify oppression of black people. Or Jews. Or women. Fill in the blank. I sent her a text thanking her for the food knowing full well that I would never sit at her dining table again. And then she texted back telling me she was going to invite us over in the near future. Okay, so since I lost sleep over this, I’m going to ask you – should I be polite and courteous (maybe I could use my religion that demands I respect her Buddhahood) but keep her at arm’s length (I rarely see her anyway) or should I just wait tell her that due to her beliefs, we would not feel welcome? Sigh. That food was damn good, too.